The Yale University women's ice hockey team will be staging another "White Out for Mandi" on Dec. 2 when the team plays host to Princeton University at Ingalls Rink. The team will utilize the game as a fundraiser for the Mandi Schwartz Foundation. On April 3, a courageous Schwartz lost her two-year battle to acute myeloid leukemia in the presence of family and friends. 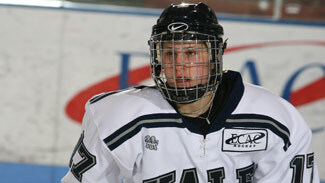 Schwartz is the sister of Jaden Schwartz, who was drafted by the St. Louis Blues in the first round in 2010. "She was everything to me," Jaden Schwartz told NHL.com back in August. "She was a huge inspiration in every aspect of life, whether it was hockey or the way she treated people. She kind of touched everybody, especially when she got sick … she never complained about a thing and kept fighting. She kept believing and, every chance she'd get, she'd go for a workout or skate despite being sick -- it was awesome." On the day of her passing, her best friend, Aleca Hughes, told NHL.com that Schwartz should "be remembered as an incredibly kind and selfless person; an extraordinary hockey player and athlete who always put others before herself." It was Hughes who started the charity in memory of her dear friend. The objective of the "White Out" is to fill Ingalls Rink with everyone wearing white in support of the effort. No admission will be charged and donations will be accepted at the door. Special white T-shirts will be sold, and youth hockey teams are encouraged to wear white jerseys. The Bulldogs will honor Mandi in a special pre-game ceremony. Last year's "White Out for Mandi" drew a crowd of 1,066 -- the most ever for a Yale women's hockey game. The event raised over $15,500. Schwartz, a Saskatchewan native, appeared in 73 straight games for Yale until being diagnosed with the disease in 2008. Her cancer went into remission, allowing her to return to practice with her teammates, but in April 2010 the cancer returned, prompting a much publicized search for a donor. "There's always time, there's always energy to help someone else who's asking for it or not," she continued. "Every time I step out onto Ingalls Rink, I think of her and her passion for the game. I feel so grateful that our paths have crossed." The "White Out" will help raise awareness of the need for marrow donors and umbilical cord blood donors. In an effort to save her life last year, Schwartz had a stem cell transplant utilizing blood from two anonymous umbilical cord blood donations. Yale also hosts an annual Mandi Schwartz Marrow Donor Registration Drive every spring to help add potential donors to the Be The Match® Registry. Currently, there are at least six matches for patients in need of transplants who have been identified through those efforts. One of those matches was a Yale field hockey player, junior Lexy Adams. The current attendance record for a hockey game at Ingalls Rink is 1,539, set on Nov. 1, 2005, when Team USA played an exhibition game against the ECAC Hockey All-Stars.